As I shared a few days ago, I am so excited to be a contributing writer for the amazing new women's magazine, Quite Magazine! And my first article has been published! And I'm sharing it with you here today - 4 Tips for Surviving Singleness and Valentine's Day. May you be inspired to embrace the season of life you are in! 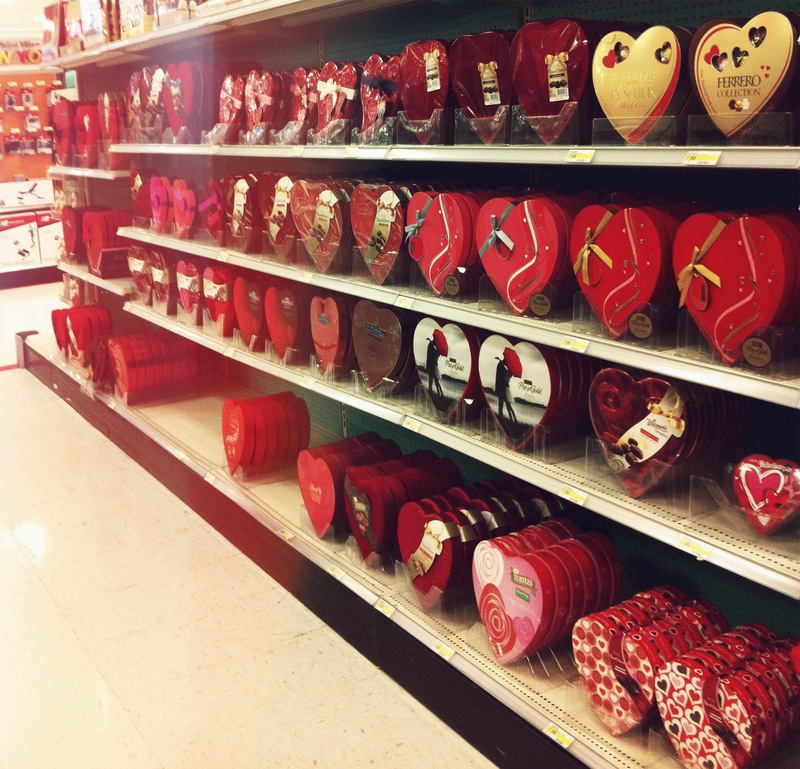 It’s that wonderful, “love is in the air” time of the year we call Valentine’s Day. Some of us look forward to it and embrace it fondly because it means bouquets of fragrant roses, little candy conversation hearts, and romantic hand-written cards. But others loathe it’s coming and anticipate it’s passing… because, you see, it can be a harsh reminder of singleness, loneliness, and longing. Being single can be lonely at any time of the year, but I have found that Valentine’s Day tends to “amp up” those feelings and can make a season of singleness more challenging to walk through. As an unmarried twenty-something woman, I understand the challenge Don’t get me wrong – I’m not saying being single is a bad thing. In fact, I have honestly found singleness to be a special blessing, a sacred time of life that is full of unique opportunities, personal growth, and a sweet season of being "just me & God." But it can also be a lonely road to walk, especially for those of us who have chosen to give our love lives over to God. For those of us who have said “no” to our culture’s idea of cheap romance and are choosing to wait for God’s best plan, who are holding out for a soulmate kind of love that will last a lifetime. 1. Remember who is writing your love story. Your love life is a special thing, a sacred thing. I believe that all too often our culture and media portray relationships and marriage as meaningless, something that is simply there for our momentary pleasure. But that is so not true. Marriage was created by God to be lasting, to be a picture of Christ and the Church, and to be a special partnership of mutual love and care between two lives who have committed to one another “til death to us part.” If you have given God your love story, remember that He is the one who created love and romance in the first place; remind yourself that He is the God who placed the stars in the Heavens and calls the sun to rise each morning. Remember that He knows you are single. And that if you are single today, it is part of His grand plan for your life. (Jeremiah 29:11) He is writing your love story. And though things may not happen in the timing that you want or the way you would like, choose to trust God’s plan. And remember that He is writing your love story – a story much sweeter than you can imagine! If you have not given your love life to God, I encourage you to ask Him to take “the pen” and write your love story. He will not let you down! 2. Don’t Just Sit Alone and Mope. Believe me, friend. I know the desire to want to eat an entire box of chocolate, turn on a tragic Chick Flick and cry your eyes out. But I encourage you – don’t wallow in self-pity. Do something fun, choose to redeem the time! You never know, this may be your last single Valentine’s Day ever! So dress up and go out with your girlfriends to a special dinner, invite friends over for a hot cocoa and game night, or offer to babysit a married couple’s little ones so they can enjoy a rare date night out. Choose to look outward instead of focusing on disappointment and loneliness. You might be surprised at how much fun you have! 3. Pray for your future husband. Every year on February 14th since I was a teenager, I write a love letter to my future husband. Whether I am dating someone or not, I always buy or make a card and spend some time on Valentine’s night before I go to sleep praying for my future husband, wherever he may be in this world, writing a few words telling him so. I always make sure I include the year. I hope that someday, when I finally marry “my man”, He is blessed & feels loved, knowing that I prayed for him before I met him. This can be a wonderful way to be purposeful in the “waiting” season. This Valentine’s Day, write a little note to your future husband. Tell him you are waiting for him, praying for him, saving yourself for him. Share with him how much you love him, even before you meet him. Take this time and make something beautiful out of it. And when your Prince Charming comes along, how amazing will it be for him to know that you thought of him before you've met him! Embrace this season of singleness and choose to grow and sow seeds that will someday be a blessing in your future marriage! 4. Know you are loved. It is so important to remember that you are loved immeasurably by God. Being single does not mean you are unloved or unwanted. It means that God does not want to share you yet! Seize this time and choose to open your heart to the love of God. He can fill your heart and complete you in a way no human ever can. See this time as sweet and sacred, spending time alone with Jesus. Don’t spend this time in the “waiting room” pacing around and worrying; spend it waiting on God, listening to Him, following Him. And believe that HE is the everlasting and most satisfying love there is! “Often a Christian man or woman falls prey to that cruel and vexatious spirit, wondering how to find marriage, who, when, where? It is on God that we should wait, as a waiter waits--not for but on the customer--alert, watchful, attentive, with no agenda of his own, ready to do whatever is wanted. 'My soul, wait only upon God; for my expectation is from Him.' (Ps. 62:5) In Him alone lie our security, our confidence, our trust. And remember, it is better to be single than to be with the wrong person. Being single is not the end of the world! You are precious, beautiful, and special whether you have a man in your life or not. Your identity and value does not lie in your relationships status. I encourage you to run to God, and to find your fulfillment in Him because He loves you. He loves you oh so much. After all, He is the best Valentine there is. I actually do just that. Eat chocolate & watch sappy/pretty chick flicks. Not because of self-pity though. I love chocolate & I love chick flicks. They go together. I think I'm one of the very few single women who doesn't even care for Valentine's Day. I don't think it's as big of a deal as people make it out to be. It's just one day. TO be honest, I'd prefer being with someone who doesn't need a holiday as an excuse to be sweet & romantic. That should be all year long. This post rocks Erin! It's my first Valentine's Day in a long time being single. I'm definitely trying every single thing in your post this year! Great post! Love Vday single or married its been a fav holiday of mine! Happy Friday! This is beautiful and such a great reminder of the greatest love story of all time!! This is great...really needed to be reminded. And in a very real, down to earth way like you did. And I need to re-read Elisabeth Elliot's book again. Great post Erin and congrats on being published:)! Being single is tough...it's actually harder for me during the holidays (thanksgiving thru New Years) because I'm bombarded with questions and surrounded by married couples. I actually don't mind V-day:)! I love this!! Last year I deemed Valentine's Day "Love in my life awareness day" instead of "single's awareness day" and I liked it so much better! I also always buy myself shoes for Valentine's Day! Score! I loved this article when I first read it. I'm going to start writing a letter to my future husband. This is beautiful!!!! Personally I'm not single, but for many older adult years I was. I think this is a lovely, inspiring and well written article. Thank you so much for sharing this with us!!!! 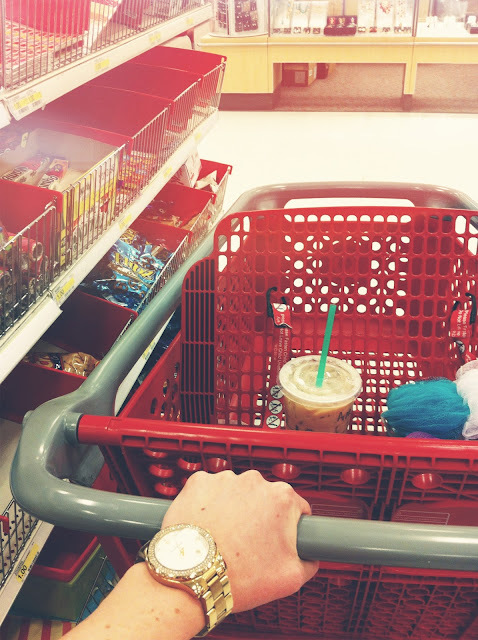 I also love the picture of your target shopping cart. Looks just like mine with a Starbucks cup in it :P makes target even that much better than it already is!!!! Have a beautiful St. Valentines day this year! Thank you so much for writing this! As a 20 something girl who has recently gone through a break up and tends to be friends with "serial daters" (girls who always seem to have a boyfriend) this post is such a pick me up! I love idea of writing a love note to your future husband, I find myself praying for him more and more, but there's something about putting it in writing that makes it more real. And as you said, how cool for him to read when the time comes? Thank you again for your posts, they seem to say just what I need to hear. Thank you for sharing and writing this! I completely agree with everything you had to say--and really loved numbers 3 and 4. I will definitely be starting the tradition of writing and praying for my future husband. And I agree, what better way to do it than on Valentine's Day?! Thank you for that idea! And thank you for the reminder that I AM loved. By Him, the most important one of all. I really, really loved when you wrote "Being single does not mean you are unloved or unwanted. God just doesn't want to share you yet!" It's so easy to get caught up in the Valentine's Day love that society pressures us with and it's so easy to think that because I am single (and have been my entire life), I will stay that way forever. Thank you for helping me practice patience and love this Valentine's Day season! Thank you so much for this Erin. I'm still so young, but this message was exactly what I needed to hear today. It opened my heart and eyes a whole lot, and just really encouraged me. I needed to hear this so badly, I'm so thankful I took some time to read this. Thank you for sharing your heart, it means a lot. Praying for you and your future husband...He's gonna get such a priceless treasure!!! I love it...pray for your future husband. Gods timing is everything...we need to remember its not on our own timeframe! Great post! I absolutely LOVED this post! I always have to remind myself of the gift of singleness! I used to be the girl that deep down was always upset about not having "someone special" on Valentines day, even when I was in a relationship it wasn't all it was cracked up to be. I now see who is exactly my special someone and that is God! Thank you for this beautiful reminder! So true! Thanks for the encouraging reminder, friend! and I LOVE Elisabeth Elliot! She's so great. i loved reading this, erin...and i love you! you are such the encouragement that i need.